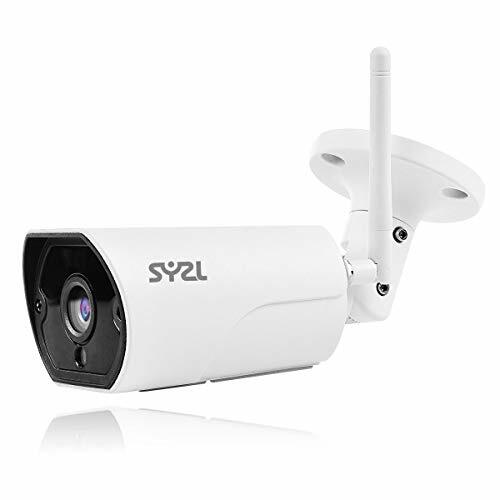 The YI Outdoor Camera 1080p is the latest addition to the YI Home Camera series, it features high definition recording and IP65 waterproof rating so it can withstand the outdoor environment. Integrated two-way audio with a waterproof mic allows you to communicate with guests, and the deterrent alarm with motion detection can scare off potential intruders. Its enhanced night vision features 12 850nm infrared LEDs providing a night time viewing distance of up to 50 feet. The 110 lens gives a comfortable viewing range, and with the universal ball mount you can adjust the viewing direction to almost any position. 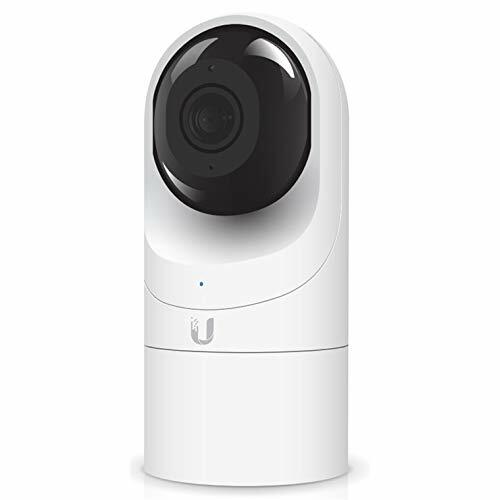 Like the entire YI Home Camera series, the YI Outdoor Camera 1080p supports YI Cloud to ensure that all your footage is secure from theft and damage, and the accompanying YI Home App lets you view the YI Outdoor Camera s live feed on demand, from anywhere, at any time. Full HD Video Quality - High resolution images in 1080p resolution, combined with a 110 lens and universal ball mount delivers clarity in every direction. Weather-resistant - Outdoor cameras are waterproof, so you can use them for outdoor and indoor. Motion-activated alerts / app notifications right to your phone when movements detected. First-class Night Vision - 12 infrared LED beads provides a night time viewing distance of up to 50 feet, ensuring excellent low light performance. Two-way Audio - 360 noise-canceling hypersensitive microphone eliminates excess environmental noise for much clearer sound quality and allows you to communicate with welcomed guests, and deterrent alarm can get rid of unwanted guests. YI Cloud with 1-month Free Trial - Provide the most efficient compression and the highest protection of data to ensure all your videos are safe and protected, avoiding the risk of losing footage from a SD card. 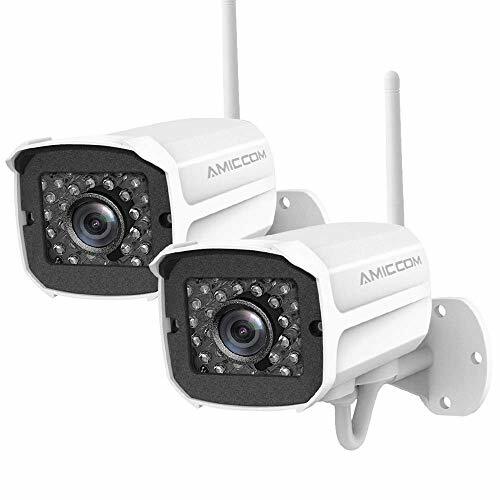 5MP HD and 100FT NIGHT VISION & WIDE VIEWING ANGLE: 5MP Super HD camera, long-distance night vision range 65-100ft with 18 infrared LEDs, up to 80 wide viewing angle, capture more clearer and sharper images and video, great for driveway, hallways, etc. POE OUTDOOR and INDOOR: PoE with only one Ethernet cable (up to 330ft), no power adapter needed, optional PoE switch or injector, easy setup with plug and play, waterproof camera, fit for indoor and outdoor, residential areas, retail store, business. SMART MOTION DETECT and ALERT: Smart motion detection, motion recording and real-time motion alert via email, app push notification to mobile phone, FTP upload snapshots and videos, motion sensibility adjustment - accurate and smart motion detection less false alarm. FREE APPS and REMOTE VIEW: Free and intuitive Reolink Client and mobile app for iPhone & Android, PC Windows & MAC, no monthly subscription fee, support at least 8 camera sources, live view, remote view, motion detection, live stream control, and recorded video playback. AUDIO FUNCTION and 24/7 NVR RECORDING: Built-in microphone, audio function; 24/7 HD video recording and storage with Reolink PoE network video recorders (support up to 16 cameras and with built-in 3TB HDD). 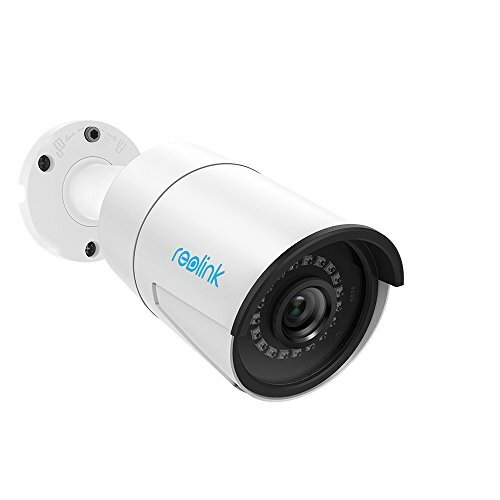 Reolink RLC-410 is packed with 4MP HD camera, supporting 80 wide viewing angle, 100ft night vision range, built-in microphone, motion detection, and motion alerts. Outfitted with a waterproof housing, RLC-410 is solid for outdoor and indoor use, such as front door, backyard, driveway, garage security. It's powered over Ethernet cable, easy connection and installation, suitable for DIY. 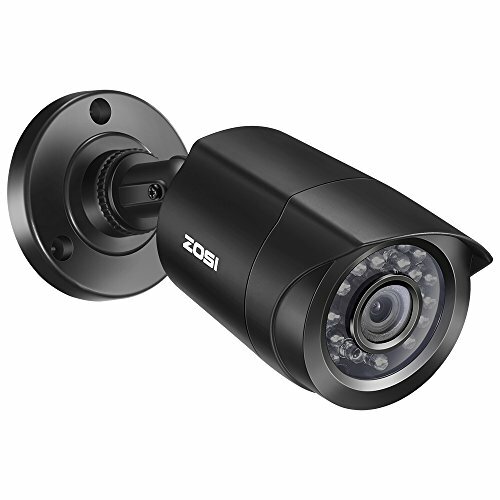 4MP HD 100FT NIGHT VISION and WIDE VIEWING ANGLE: 4MP 1440p Super HD camera, long-distance night vision range 65-100ft with 18 infrared LEDs, up to 80 wide viewing angle, capture more clearer and sharper images and video, great for driveway, hallways, etc. POE OUTDOOR and INDOOR: PoE with only one Ethernet cable (up to 330ft), works with PoE switch,injector,NVR, no power adapter needed, easy setup with plug and play, waterproof camera, fit for indoor and outdoor, residential areas, retail store, business. SMART MOTION DETECT and ALERT: Schedulable Motion detection, motion recording and real-time motion alert via email, app push notification to mobile phone, FTP upload snapshots and videos, motion sensibility adjustment - accurate and smart motion detection less false alarm. FREE VERSITLE APPS and REMOTE VIEW: Free and intuitive Reolink Client and mobile app for iPhone and Android, PC Windows and MAC, no monthly subscription fee, support at least 8 camera sources, live view, remote view, motion detection, live stream control, and recorded video playback. SD Card or NVR RECORDING: Comes with SD card slot( SD card not included), support up to 64Gb micro SD card for recording. 24x7 HD video recording and storage with Reolink PoE network video recorders (support up to 16 cameras and with built-in 3TB HDD). Do you want to keep an eye on all your valuables even when you are not close by? Or are you looking for that reliable all-day all-night security surveillance? Why Worry? Click Add to Cart now to Keep Everything Safe! 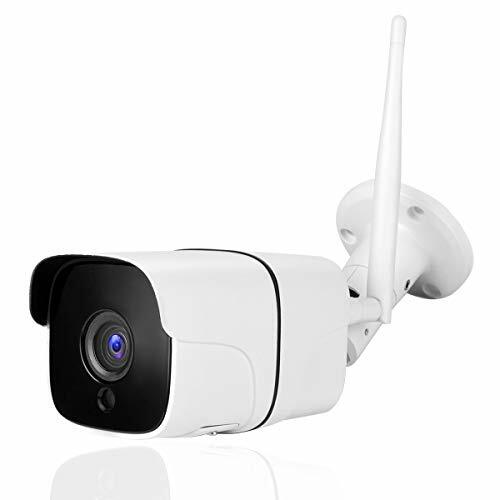 IP66 Weatherproof Rating: This wifi surveillance camera boasts IP66 standard waterproof rating to ensures perfect security monitoring in all conditions weather. 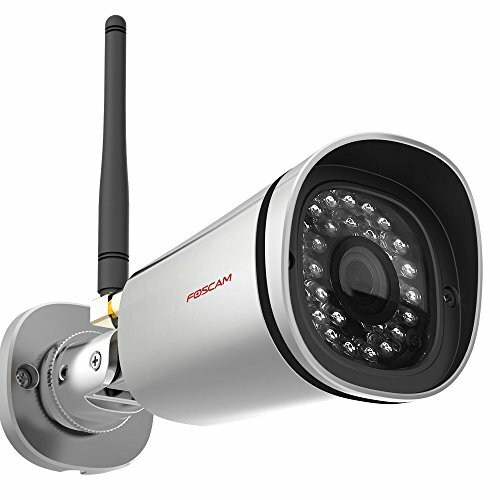 The -20 -50 temperature operational range ensures the Wi-Fi security camera works both indoors and outdoors. DAY AND NIGHT SURVEILLANCE: Featuring 3.6mm fixed lens, and 24m night vision range, this wifi security camera which allows you to clearly see in darkness, keeping your property protected day and night. Enjoy up to 128GB SD! Store & record events and keep everything safe. FULL HD SURVEILLANCE: The 1080p video resolution is complimented, 2MP High-Resolution Lens and wide 90 viewing angle, providing you with exceptional HD experience with clear and colorful images. Comes with user manual for easy installation. 1080P HD & NIGHT VISION Netvue outdoor wifi camera capture high-res 1080p images thanks to our home security camera's 36mm lens that also provides a 100 view. Also, get live full HD video both day and night thanks to its infrared LED's letting you see up to 60 feet in the dark. 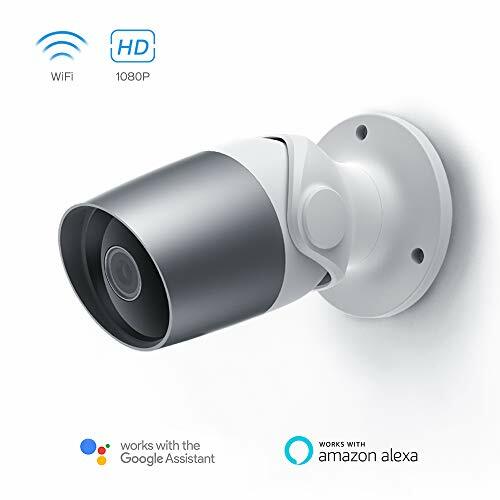 COMPATIABLE WITH WIFI / ETHERNET & ALEXA Netvue WiFi outdoor security camera works perfectly when connected 2.4GHz wifi or hard line ethernet connection. And Netvue outdoor camera is compatible with Alexa, Echo Show, Echo Spot, or Fire TV. TWO-WAY AUDIO & CLOUD STORAGE Netvue outside WiFi cameras security allows you to communicate with welcomed guests, and deterrent alarm can get rid of unwanted guests. Store all of your 24/7 recorded security surveillance footage from our outdoor camera to our cloud or use a Micro SD card (Max 128GB). SMART MOTION DETECT & ALERT Netvue outdoor surveillance camera schedulable motion detection, motion recording and real-time motion alert via APP, upload snapshots and videos, motion sensibility adjustment, accurate and smart motion detection less false alarm. IP66 WATERPROOF Netvue IP66 professional home security camera, temperature ranges from -4 F to 122 F (-20 C to 50 C). Which means the motion security camera is strong enough to withstand rough weather and Vandal Resistant, even in the storm and snowy weather. REAL-TIME MOTION DETECTION ALERTS: Send you alert emails with photos or 30-second video clips in real time. Push notifications to mobile phones, when a thing happens. RLC 410W with 2560x1440 high resolution captures more beautiful and smoother 4-megapixel live video streaming and clips than 720p and 1080p cameras. It sees your home security more clearly. No details will be missed. Dual Band WiFi Stronger Network Signals. 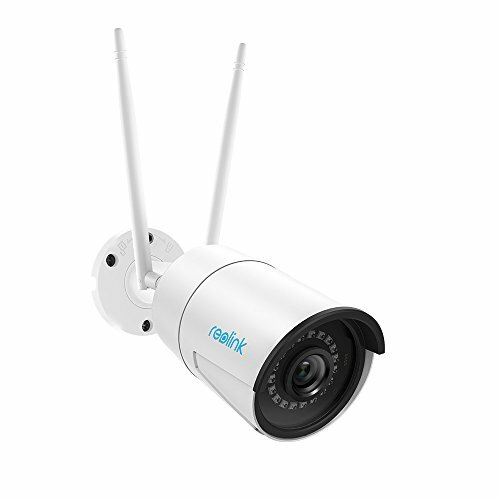 Reolink wireless cameras are the first dual-band WiFi security cameras in the world, with 2.4 GHz band and 5 GHz band available, and 2T2R MIMO antennas. You will never worry about network off-line. The Easiest Way for Remote Access and Control. Wherever you are and whenever it is, you can remotely access this wireless camera to get live streaming and monitor your home and business. RLC 410W comes with a memory card slot and you can insert a Micro SD Card (up to 64GB). In addition, it works with Reolink NVR for 24/7 reliable recording. REOLINK 100% SATISFACTION GUARANTEE ensures this will quickly become your favorite no-risk purchase. Many people are stocking up with several to place around their property and use at work. 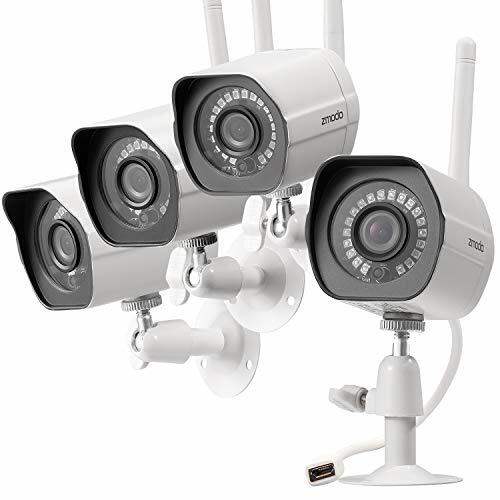 HURRY AND BUY NOW while we have this very popular wireless security camera set in plentiful supply. It's selling quickly. This makes a fine birthday gift, holiday present, anniversary gift, or for Father's Day and Mother's Day. SOLIOM S60 solar security camera for outdoor or indoor use, wide angle, day and night vision with accurate quick movement tracking control. Surveillance system for home and business, waterproof and mobile app connect. 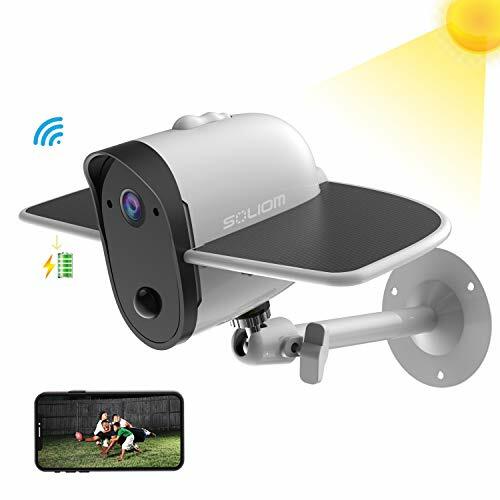 WIRELESS SOLAR POWERED OUTDOOR SECURITY CAMERA with built-in 4000mah battery: Soliom S60 wifi Security Cam is reliable & self-sustained by solar light panel. So you can enjoy the peace of mind not worrying about replacing battery or expensive energy bills. Soliom app will show the low power notification to remind a manual charge if camera consumption greater than recharge. WIDE ANGLE & FULL IP66 WEATHERPROOF: Soliom S60 is the ultimate Outdoor Security Camera for home and business with a wide angle of vision, made from high-quality plastics to withstand extreme weather. Its new generation battery works at temperatures between -4 to 140 (-20 +60 ). IP66 weatherproof grade for safest use in your yard. ACCURATE MOTION DETECTOR & ALARM: The Outdoor IP Cam features an exclusive two-way motion detection technology that allows to reduce false alerts, with 0.7-second quick trigger speed. When motion is detected, the cam will send an alert to your smartphone and record a short video clip into the cloud and memory card. ADVANCED DAY AND NIGHT VISION: Our surveillance system has an impressive 1080p full HD day time video quality with 5 refined layers of glass lenses. It uses the best LED light to enhance night-vision, with max 33-49ft visible distance and auto switch day to night mode. Stay safe with a reliable and clear 24/7 non-stop indoor and outdoor home security. EASY HARDWARE INSTALLATION AND CLEAR TWO WAY TALK: Soliom S60 is WiFi enabled wireless IP security camera thanks to the Soliom free app that allows you to remotely monitor your yard entrance, garage, office, garden, home, at any time with live view video. The clear two-way talk lets you hear and speak to anyone who is within its range. Stunning UltraHD 4K (8-Megapixel / 3840x2160) resolution , 4K @15fps. Best in class low light capability utilizing the latest Sony Starvis image sensor and Ambarella S3LM chipset. Super-Wide 112 viewing angle. Playback and record professionally on a PC using the Amcrest Surveillance Pro for Windows and MAC (included) or Blue Iris Professional. Features a Sony Starvis 1/2.5" 8MP progressive image sensor to achieve unsurpassed low-light capability and night-vision up to 131 feet. Works with Amcrest Cloud remote video storage, MicroSD, Amcrest NVRs, Synology and QNAP NAS & FTP. Works with Pale Moon (32bit) and SeaMonkey browsers, IE, Safari 11, Firefox 49.0 and Chrome with Amcrest Web View Extension. Heavy-duty metal IP67 Outdoor Weatherproof Camera. Dual H.265/H.246 compression allows for maximum encryption with the latest technology as well as backwards compatibility with legacy platforms. Operating Conditions: -30 C ~ +60 C (-22 F ~ +140 F) Less than 95% RH. Compatible with the following Amcrest Junction Boxes, ASIN: B07CB468HC, B07FK662Z5. POE power supply (injector or switch) required but not included. Bullet Dimensions: 6.9 x 2.7 x 2.7 inches. Bullet Weight: 1.1 lbs. EXPERIENCE ULTRA HD 4K - Stunning ultra-high quality 4K (8-Megapixel / 3840x2160) resolution featuring enhanced low light capability utilizing the latest Sony Starvis image sensor and Ambarella S3LM chipset. Super-wide 112 viewing angle allows you to cover more ground and keep more of what matters to you safe. Power Over Ethernet (POE camera) for easy installation (POE Injector or Switch Required; Not Included, Sold Separately). SMARTER SECURITY - Receive motion alert notifications and review footage via your smartphone with the Amcrest View app. Playback and record professionally on a PC using the Amcrest Surveillance Pro for Windows and MAC (included) or Blue Iris Professional. Works with Amcrest Cloud remote video storage, MicroSd card, Amcrest NVRs, Synology and QNAP NAS, FTP, Pale Moon and Sea Monkey Browsers, IE, Safari, Firefox 49.0 and Chrome with Amcrest Web View Extension. 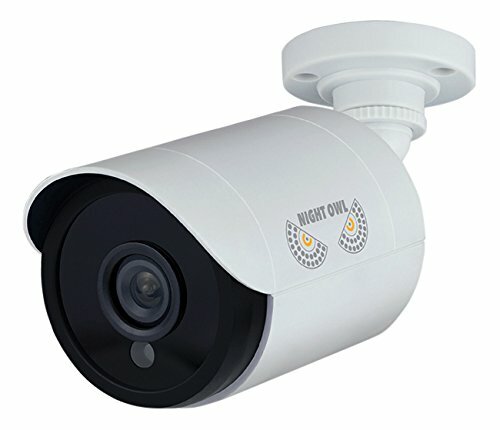 DAY OR NIGHT, RAIN OR SHINE - Built to whether any storm and the darkest of nights, this 4K PoE IP Camera features a heavy-duty metal weatherproof IP67 housing as well as built-in IR LEDs and a Sony Starvis 1/2.5 8MP progressive image sensor to achieve unsurpassed low-light capability and night-vision up to 131 feet. Dual H.265/H.246 compression allows for maximum encryption with the latest technology as well as backwards compatibility with legacy platforms. SECURE CLOUD VIDEO BACKUP - The optional Amcrest Cloud remote video storage subscription service allows you automatically store your videos off-site in a third-party location hosted and secured by Amazon AWS. This way if something happens to your local PC/NVR/SDcard/NAS, the footage will be safely recorded in a secure off-site location and accessible to you through a web-based Flash interface for PC (Chrome/Firefox/Safari/Edge) and AmcrestCloud smartphone app. EXPERIENCE 2K HD - Observe magnificent beyond 1080P Full HD resolution with 3MP 2304*1296 at 20FPS and 2MP 1920*1080 at 30fps. 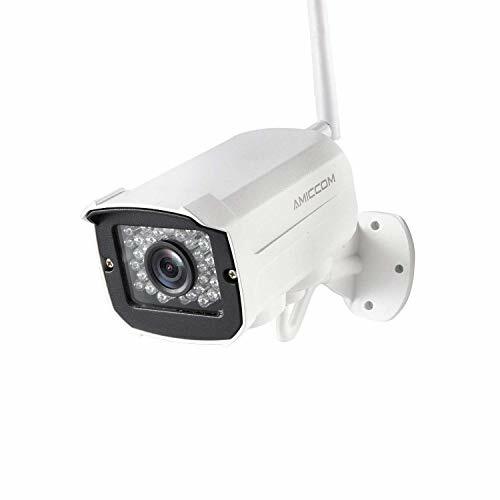 This wireless outdoor security camera features the latest Ambarella chipset for stunning picture quality and clarity. Compatible with Alexa on Echo Show. SMARTER SAFER SECURITY - Receive alerts from your outdoor wireless camera to your PC or iOS/Android smartphone and record events and store them on Amcrest Cloud, MicroSD, NVR, Synology/QNAP/WD NAS, FTP, Blue Iris. IP67 Weatherproof with Wide 100 Viewing Angle and Night Vision up to 98 feet. SIMPLE RELIABLE SECURE - We want to ensure the safety of our customers, their loved ones, homes, and businesses. 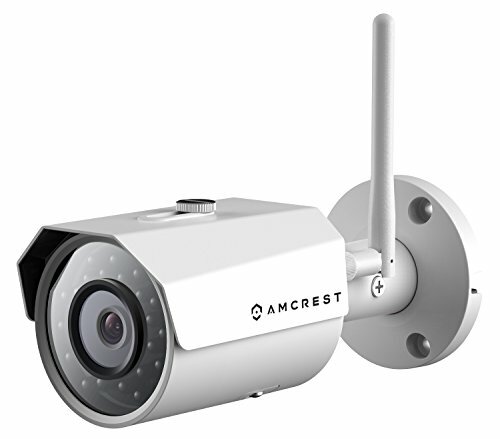 This wireless security camera features secure HTTPS/SSL and WPA2/AES encryption, and a 1-year US Warranty and Lifetime Support provided by Amcrest. Magnificent Ultra High Definition 3-Megapixel / 1296P Video at 20fps (2MP/1080p at 30fps) with Latest Ambarella Chipset for Beyond-Amazing Picture Quality and Clarity. Compatible with Alexa on Echo Show. Quick and Easy Wi-Fi Setup via iOS or Android Device with Amcrest View App, Stream Video Directly to Your Smartphone, Tablet, Apple Mac or Windows PC. Great Field of View with Wide 100 Viewing Angle, Intelligent Digital Zoom and Night Vision up to 98 feet. Stay in Touch with Intelligent Motion Alerts as well as Mobile and Web Apps, Secure SSL Connectivity with HTTPS and AES Encryption. Cloud Recording and Playback with Free Live Viewing and 4 Hours of Free Storage via AmcrestCloud, Record and Playback Directly on MicroSD Card and Amcrest NVR (Not Included). The Amcrest HD Series 1. 3MP Wi-Fi Bullet video camera helps you stay in touch with what you love anytime, anywhere. With its quick Wi-Fi Setup process via mobile phone, you will have secure access to your camera's video stream in no time. Stream live and playback recorded video of your home, your kids, your pets, or your business on the go with the Amcrest View app. Amcrest cloud offers optional cloud recording with free live viewing and 4 hours of free video storage accessible from any device including Apple Mac, Windows PC, iPhone, iPad or Android devices. 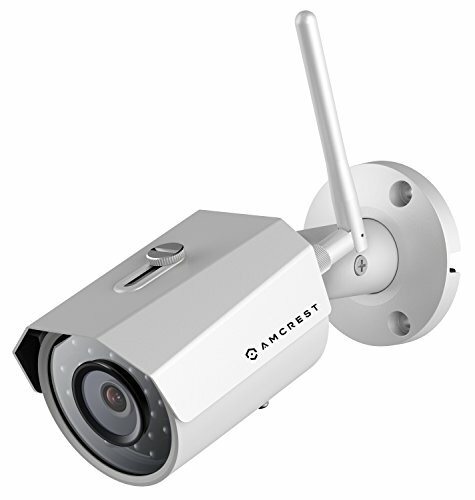 Amcrest cameras also record via upload to an FTP as well as record to any Amcrest (or ONVIF compliant) network video recorder (NVR) (not included). 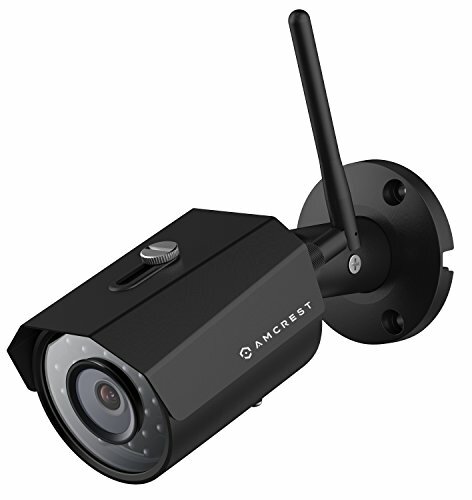 Each Amcrest camera features 98ft night vision, enhanced digital zoom, a wide 92 viewing angle, smart motion alerts, email alerts and snapshots, advanced recording options, secure SSL/HTTPS connection and wireless AES WPA2 encryption. With the Amcrest HD Series, you'll never be out of the loop again. Stunning Full-HD 1. 3MP Video at 20fps with Latest Ambarella S2LM Chipset for Amazing Picture Quality and Clarity. Embedded microSD card slot that supports up to 64GB microSD cards (not included). 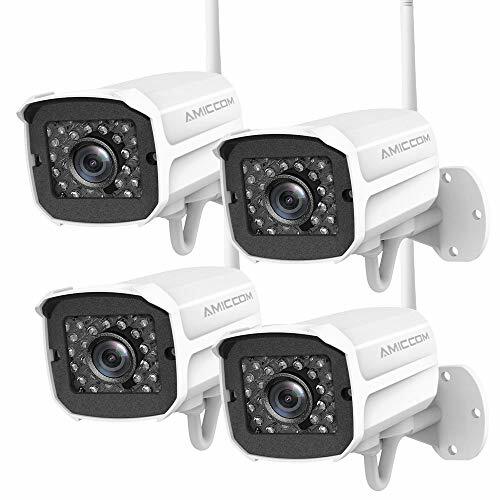 The Zmodo wireless security camera system (4 Pack) is a 4 camera monitoring solution for your home or business. Setup is as simple as downloading the free Zmodo App, creating an account, and connect the cameras to your Wi-Fi. Once setup, you can remotely view from anywhere with a smartphone, iPad or PC. Enjoy peace of mind no matter where you are and be notified when something happens. Advantages * Easy Setup - Connect the cameras within minutes using Zmodo app. * Easy Remote Access - Enjoy peace of mind via your smartphone no matter where you are. * Stay Connected - Be notified when something happens with intelligent mobile alerts. * Free 30-day Cloud Storage - All users are eligible for a 1-month free cloud of our 7 day cloud recording plan. With the plan, you can review, save, and share footage at any time, and reduce false alerts with cloud intelligence. 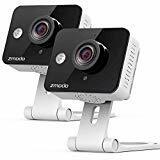 * Works with Alexa - Zmodo Wireless Outdoor Camera is compatible with Echo Show for voice control. (Alexa device sold separately). Please check and update your product to the latest device version in order for it to interact with Amazon Alexa. Always Stay Connected - Seamlessly stream video remotely via the mobile Zmodo app for iOS and Android or via Internet browser on user. zmodo. com anywhere anytime. Receive intelligent motion alerts on your mobile phone when motions detected. Playback motion videos to check for the missed moments. Improved motion detection enables you to set a motion detection zone on the area you care about . IR Night Vision - Equipped with infrared lights and IR cut, the camera can automatically switch to black and white night vision view when in the dark to ensure you a crystal view. The night vision sensitivity is adjustable. You can share the device to your family and your friends on the app to enjoy the happy moments in your house. Zmodo Cloud Service - All users are eligible for a 1-month free cloud of our 7 day cloud recording plan. With the plan, you can review, save, and share footage at any time, and reduce false alerts with cloud intelligence. 4. No need to scan QR code to install the wifi security camera, please install the security camera through LAN Search according to the instructions! 5. Please use SD-micro Class-10, UHS-1 or higher high speed memory card, it should be designed for surveillance camera, recommend this one, please search B00V5Q1K3O on Amazon to find it! 1. CamHi App: Please download CamHi app from Apple Store for iPhone, and Google Play for Android phone. 2. Weatherproof: This wifi security camera was made by steady aluminum with exquisite workmanship. The WiFi IP camera is durable enough for using both outdoor and indoor. 3. ONVIF Support: The wireless IP camera is interoperable with all sorts of ONVIF-conformant IP security products. 4. Multiple Devices: The wifi CCTV camera can be added on multiple devices, smart phones, tablets and computers, etc. 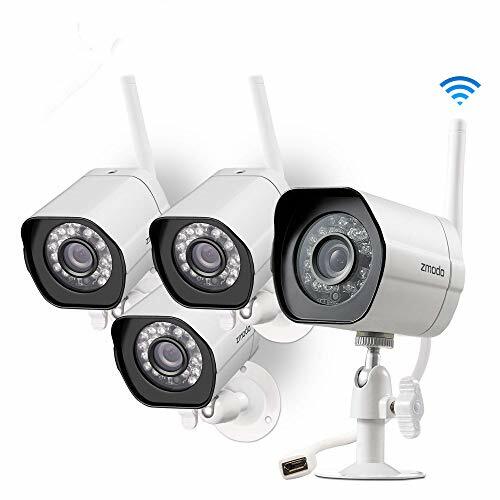 SET UP WIFI QUICKLY: This outdoor security camera with updated wifi performance, which ensures easier wifi set up and more stable wifi connection. For more detailed settings, please refer to the instructions on SV3C official website or the file that attached with emails on Amazon, please check your email account that is used for Amazon! SMART MOTION DETECTION: What's happening when you're not home? SV3C outdoor wifi camera will alert you through phone app or send snapshots to email when motion is detected. Record to Micro SD card(no sd card in the camera), the wifi Surveillance camera supports SD card up to 128GB, more storage space! Motion detection area, detecting and alarm sensitivity is adjustable on phone app! NIGHT VISION & REMOTE VIEWING: This wifi CCTV camera is equipped with 36 pcs IR led lights, the nigth vision reaches up to 67ft or further, all in your eyes! What's more, you can view the wireless IP camera remotely on your phone or Windows PC via a different WiFi when you are away from home. 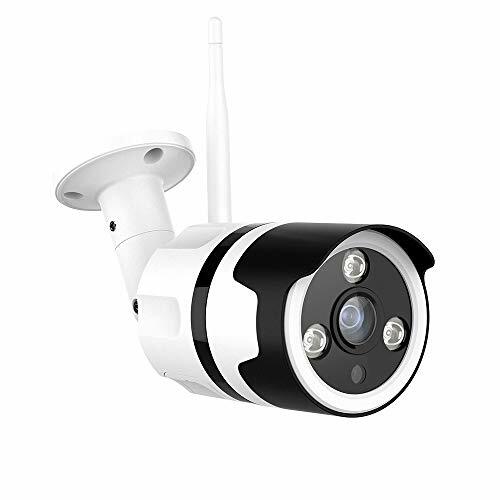 WATERPROOF FOR OUTDOOR: The waterproof level is up to ip66 and the wifi camera with full aluminium case, which means the outdoor WiFi camera is strong enough to withstand rough weather and Vandal Resistant, even in the storm and snowy weather. This waterproof security camera is ideal use for both indoor and outdoor! PACKAGE & SERVICE: SV3C wifi security camera package includes a power adapter with 9.8ft cable! 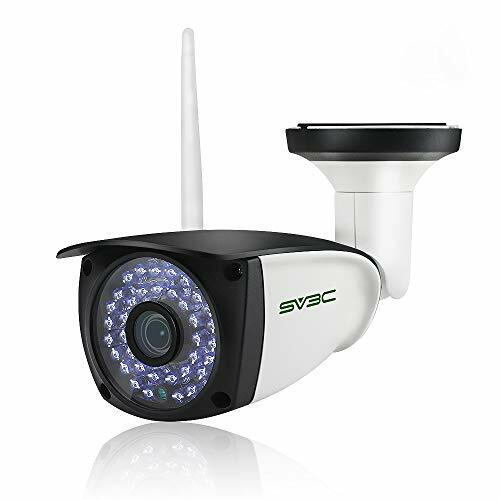 SV3C Technology provides 30 days free return, 12 months warranty, lifetime technical support, friendly customer service, if you have any questions when you receive or install the outdoor WiFi camera, please contact us through your order on Amazon, or send email to us, we will offer solutions to make you satisfied! Never Miss a Moment: Remotely access your security camera feed, motion events, and recordings to enjoy peace of mind from anywhere. Includes free local recording. Optional Foscam Cloud remote storage is also available (free trial included). Easy to Use for Anyone: Improves on traditional CCTV and home security camera systems with plug and play setup provided by the Foscam smartphone app. Simply download the Foscam app, follow the onscreen prompts, and start watching live video in minutes. Smart Technology: Motion detection and intelligent alerts can send real-time push notifications to your phone with captured images while you're away. This security camera can see 24/7 with high-intensity IR LEDs (super clear night vision up to 65ft). Advanced WDR: Intelligently corrects dark faces under heavy light, with an auto-IR cut filter to combine ultra-high color accuracy with rich 1080P Full HD and a Super Wide 118 viewing angle. This model also includes external mic/speaker audio jacks for optional outdoor two-way audio. USA Support and Warranty: Our IP66 weatherproof cameras are CE and FCC certified with UL compliant power supplies. 1080P FHD & NIGHT VISION: Netvue outdoor wifi camera capture high-res 1080p images thanks to our home security camera's 36mm lens that also provides a 100 view. Also get live full HD video both day and night thanks to its infrared LED's letting you see up to 60 feet in the dark. 1080P FHD & NIGHT VISION : Netvue outdoor wifi camera capture high-res 1080p images thanks to our home security camera's 36mm lens that also provides a 100 view. Also get live full HD video both day and night thanks to its infrared LED's letting you see up to 60 feet in the dark. 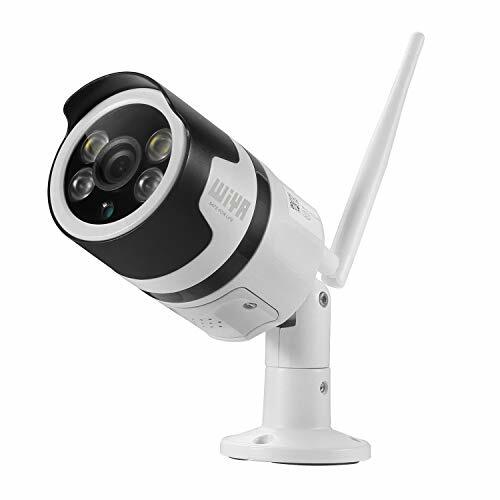 COMPATIABLE WITH WIFI / ETHERNET & ALEXA Netvue wireless outdoor security camera works perfectly when connected 2.4GHz wifi or hard line ethernet connection. And Netvue outdoor camera wireless is compatible with Alexa, Echo Show, Echo Spot, or Fire TV. TWO-WAY AUDIO & CLOUD STORAGE Netvue outside wireless cameras security allows you to communicate with welcomed guests, and deterrent alarm can get rid of unwanted guests. Store all of your 24/7 recorded security surveillance footage from our outdoor camera to our cloud or use a Micro SD card (Max 128GB). SMART MOTION DETECT & ALERT : Netvue outdoor surveillance camera wireless schedulable motion detection, motion recording and real-time motion alert via APP, upload snapshots and videos, motion sensibility adjustment, accurate and smart motion detection less false alarm. Cloud Service : With Cloud Service, you can review, customize, save, share the footage, or have a flashback of all-day details in just few seconds. Motion alert clips are saved in the cloud for 12 hours for free. All users are also eligible for a 30-day free trial of our 7-day cloud recording plan. Paid cloud recording plans for storing 24/7 footage are available in 7-day and 30-day plans. Wide Viewing Angle : With a 115 field of view, you can use one camera to capture an entire room without ever having to pan or tilt. The IR Night Vision can also help you see what's happening in low light conditions with black and white automatic infrared lights. Two-way Audio : The camera has a built-in mic so that you can talk and listen through the Zmodo app anywhere and anytime, making it feel like you never left home. Motion Alerts : This WiFi camera will send push notification alerts to your smartphone when motion is detected so you will know what's happening immediately. You can also playback motion alert video clips to check for missed moments. Full 720p HD : you can see crystal clear footage of your home with this high-resolution Mini WiFi camera. Always stay connected to your home by remote monitoring through the mobile Zmodo app for iOS and Android or via Internet browser on user.zmodo.com. This is an outdoor professional level security camera with waterproof housing for very low power consumption and super high stability.Supporting standard ONVIF Protocol/RTSP/Alarm Picture FTP upload/personal email sending/Remote control. In addition, you can use your smartphone (iPhone or Android)) or your default browser (IE, Chrome, Firefox, etc.) to view the images. 1. Camera only supports 2.4Ghz WiFi, does not support 5Ghz WiFi,. 2. Compatible with TF card up to 64 GB (not included): Please use a high speed SD card -- class 10 or above. 3.App compatibility: Please download the CamHi app. Support windows PC except for Mac. 4.It's not a battery camera,need a adapter to power it. See everything with super clarity and in beautiful color with this HD camera. It allows you to keep a close eye on your family and pets. All video captured by this camera will be presented to you via stunning videos. Receive alerts on your phone:It will alert you through mobile phone or send snapshots to email when motion is detected,Motion detection recording will be stored in the SD card after you have set it.Constantly 24 hours recording and schedule recording are optional.The camera supports up to a maximum of 64G Micro SD card (SD card not included). Equipped with high performance infrared LEDs, this camera provides you clear night vision. And with a smart IR-Cut filter, day and night vision are crisp and vivid. Stay confident that you will always have a reliable eye spy. DURABLE CONSTRUCTION: This security monitoring camera has a solid, unmatched durable aluminum housing that makes it weatherproof and ideal for both indoor and outdoor use. New Zink wireless setup technology allows you to setup your camera easily in seconds. There's no configuration necessary, just run the setup and the camera will communicate with the phone automatically. Receive notification when unexpected motion detected.You can schedule alerts by specific time and date. The automatic infrared lights make sure you can see clearly up to 80ft in the dark. You can expand and customize quickly and easily with extra cameras, to make a whole solution for your home and business. Weatherproof - This weatherproof camera can be placed both indoors and outdoors, with a supported temperature range from -10 to 50 . Protect every inch of your home through every season. Always Stay Connected - Seamlessly stream video remotely via the mobile Zmodo app for iOS and Android or via Internet browser on user.zmodo.com anywhere anytime. Receive intelligent motion alerts on your mobile phone when motions detected. Playback motion videos to check for the missed moments. Improved motion detection enables you to set a motion detection zone on the area you care about . (3).Slidable Aluminum Casing Weather resistant design for outdoor or indoor use. (4).One Blinking Red Night Vision LED, Stays illuminated during darkness to make it look real. This outdoor security camera is fully integrated with Alexa Echo Show directly, you can now control the smart security camera without lifting a finger, just the voice command alone. Record the clearer images in real 1920*1080p resolution at 25 frames per second day and night. A 110 wide lens combined to deliver an ideal viewing range. Built-in detection sensor allows you to receive the real-time notification when the camera detects the actions or sounds. The adjustment sensitivity by low/medium/high can meet your different needs in life, the WiFi outdoor camera gives you a sense of security. Equipped the auto infrared LED for night vision with a viewing distance up to 32ft to see what's happening in low light or even in the dark, provide you a good night experience clearly even in the pitch black. With an integrated Mic and Speaker, you can communicate with your guests smoothly and clearly. Also, make the instant reaction to the unwanted intruders around your house. Available for cloud storage with different plan to record the video, and add a 128GB MicroSD card for local storage to keep your files in your preferred way. The IP65 rating ensures perfect security monitoring even rain or shine, the -20 -55 temperature makes the WiFi camera to work both indoor and outdoor, a great solution for home security. 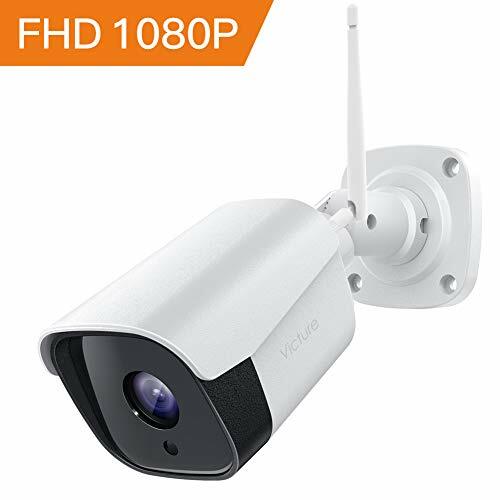 [FHD 1080P & Night Vision]Give you a colorful high-quality image in 1080p resolution day and night, and combined a 110 wide lens to cover more spaces clearly even in the pitch dark with a night vision distance up to 32ft. [Two-Way Audio]Fitted with Mic & Speaker allows you to communicate with the welcomed guests remotely, and deter the stranger looks around your house. [Intelligent Alerts]Smart detection enables you to receive the real-time notification of actions and sounds while detected, make you more easily to monitor your home anywhere. [Weatherproof]The IP65 weatherproof camera can be placed both indoor and outdoor to keep recording the clear full HD images even rain or shine, protect your home through every season. Victure outdoor security IP camera is easy for users to set up, only with few steps. Both WiFi and wired are supported. The unique encryption technology is adopted by this outdoor camera to save videos on micro SD card. Nobody can copy the SD card's video file through the card reader even when your outdoor camera or SD card is stolen. Video files in SD card can only be accessed by yourself in your own account. We stand behind the quality of our product and if for any reason it fails within the first 12 months of warranty we will replace it. If you have any questionsof the outdoor camera, email customer service at bulletcam@govicture.com. We ensure 100% satisfaction and we will do our best to resolve the problem. Weatherproof Guard IP66 weatherproof makes Victure outdoor security camera ideal for using outside and keep recording in the ever-changing outdoor environment no matter rain or shine. View Your World in HD 1080P Video Resolution (1920*1080) with 120 wide-angle lens delivers clear picture in any direction, providing nice, clear & colorful image in the daytime.The 36*850nm infrared night vision see in pitch dark up to 50 feet. This outdoor camera capture clearer details and provides safety in day and night. Motion Detective Alarm Notification will be sent to your smartphone when motion is detected from outdoor camera. Two-Way Audio This outdoor camera with an integrated mic and high-power speaker allows you communicate with welcomed guests and your family member clearly no matter where you are. SD Card Storage Local storage of this security camera supports up to 64GB Micro SD card. Encrypted security cloud storage service is also supported. Easy installation: Easy download CamHi app from Google Store, plug and play, Free choice of wired or wireless connection, support PC, mobile phone. Two-way audio: The camera built-in speaker and microphone, you can communicate with your family or friend anytime and anythere, or you can also prevent thief to steal when you not at home. External Micro SD card slot ,up to 128GB,H.264 compression format. Application range: This wireless camera is widely used in homes, shops, warehouses, hotels, hotels, schools, companies, offices and other places, easy to install convenient, and can be remotely monitored. Easy WIFI Installation and Compatible Software Simply download the Camhi app, follow the onscreen prompts, and start watching live video in minutes. And plug in the power, only support 2.4Ghz wifi connecting (not support 5G yet ), it also supports 3rd party software like: Blue Iris, iSpy, VLC, Roku Box and so on. Two-way audio & Remote Monitor This wireless outdoor camera has built-in speaker and microphone, enable push-to-talk capability, so you can listen in and talk back with your family members or stranger while install it outside of your building, and you can view anywhere anytime that you want monitor. Motion Detection Smart Alert & Micro SD Card Motion detection and intelligent alerts can send you real-time notifications with captured images to your mobile device wherever you are, it's easy for you to protect your family, pet, baby and so on. And it supports 128GB Micro SD card which can record up to 2 weeks(SD card is not included in the package), playback from app to check anytime which in recording range. Night Vision & Waterproof IP66 True resolution:1920*1080, and it has 30pcs Infrared IR LED, night vision up to 65ft. It can also show high-quality of day and night surveillance, and this wifi weatherproof camera can be installed interior of building or outdoor, Full weather resistant for rain, snow, dust, wind, salty and more terrior conditions based on it's IP66 international industrial standard. Package & Service The wireless outdoor camera including 10ft power cable, high gain antenna; we always provide friendly customer service and best technical support. We also provide 30-days return policy and 2-year warranty. Any questions during installation, please contact our customer service. The camera is equipped with 36 infrared LEDs, which will activate whenit is dark or low light to display black and white night vision capability up to 100 feet.